It is just over 45 weeks before the last possible date of a general election - Thursday, 3 June 2010. We delved into the archives to find out what was happening this far out from two key recent elections - and discovered some fascinating parallels. Remember "I love the 1990s? ", the television show where minor celebrities reminisced about the cultural highlights of the previous decade? Well, something very similar is going on in Downing Street at the moment, according to some accounts. Prime Minister Gordon Brown is said to be focusing very closely on the year 1992 when an unelected prime minister - John Major - defied the odds to win his own mandate and an historic fourth term for his party. The star attraction, in Mr Brown's version of "I love 1992" is Northern Ireland Secretary Shaun Woodward, who in a previous life was a Tory adviser and MP. As a key architect of the "Labour's tax bombshell" campaign, Mr Woodward has been able to give Mr Brown an insiders' account of how the Conservatives torpedoed Neil Kinnock's hopes of entering Number 10. Over at Tory HQ, they are more likely to be playing "I love 1997" - the year in which a young, charismatic leader (cue pictures of a grinning Tony Blair striding up Downing Street) led a rejuvenated party to a landslide victory over an exhausted government. It has often been said that David Cameron has modelled his leadership of the Conservative Party on New Labour, with a close-knit group of young modernisers forcing change on a sometimes reluctant party. But with a little under a year until the next election do the comparisons actually hold up? And can Mr Cameron and Mr Brown learn anything more from the two pivotal elections of the 1990s, which still cast a long shadow over British politics? With just over 45 weeks to go to the 1992 general election, Britain was, like now, in the depths of a savage recession, with unemployment rising and public spending facing a major squeeze. The newspaper headlines were dominated by job losses and plummeting house prices, although the tabloids were more preoccupied with footballer Paul Gascoigne's move to Italian club Lazio, which after months of wrangling was confirmed. Prime Minister John Major, who had recently taken over from Margaret Thatcher following an internal party coup, was pinning all his hopes on an early economic recovery. Labour leader Neil Kinnock dubbed him "Manana Major" for always promising economic recovery was just around the corner and attacked him for being a "ditherer" and "delayer" for not calling an immediate election. 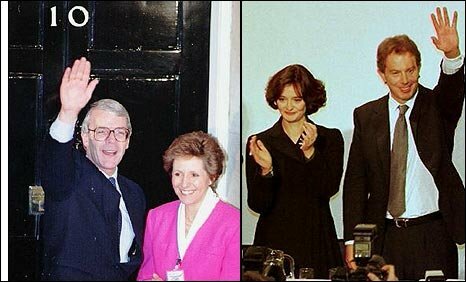 Unlike the current prime minister, John Major was still enjoying a relative honeymoon period in the polls and had received a further popularity boost from what was seen as his steady leadership during the Gulf War. Voter anger over the poll tax was still raw - and a surprise defeat in the Ribble Valley by-election, to the Lib Dems, coupled with poor local election results put paid to talk of a snap general election. But Mr Major had cut Mr Kinnock's lead in the opinion polls from 12% to 3.5% and it was the Labour leader, not him, who was facing leadership mutterings. The public seemed prepared to give the new Tory leader the benefit of the doubt. Political debate was dominated, then as now, by tax and spending - but both main parties were far more forthcoming about what their plans were. 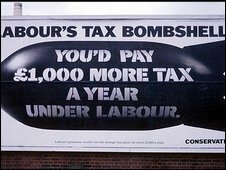 The then shadow chancellor John Smith attacked Tory plans for a 20p basic rate of income tax as "irresponsible" and ruled out any cuts in income tax under a Labour government. The decision later to be upfront with voters about proposed tax increases - Smith also proposed a new higher rate of tax - was seen as one of the reasons Labour lost in 1992. Since then Labour has been careful not to go into elections promising tax rises - but the central theme of Tory cuts versus Labour investment, which John Smith was spelling out in the early 1990s, remains at the core of Gordon Brown's political philosophy. Spool forward five years from 1991 and you find Labour in the ascendant under Tony Blair and John Major staring defeat in the face. But with 45 weeks or so to go before the 1997 general election, politics was the last thing on the nation's mind. 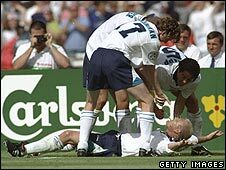 Paul Gascoigne (him again) had just scored a "wonder goal" to help the England football team to a two nil victory over Scotland in Euro 96 - celebrating by mocking the infamous "dentist's chair" stories about England footballers' drinking habits. "PARTY TIME! ; TERRY'S BOOZE BOYS LAP UP THE SCOTCH", screamed The Sunday People. "SHEAROES! ; AL, GAZZA LIGHT UP WEMBLEY", said the Sunday Mirror, referring to the other goal scorer Alan Shearer. At that year's Labour conference in the autumn, Tony Blair would shamelessly tap into Euro 96 fever, adapting the words of the summer's biggest chart hit, to tell the party faithful: "Seventeen years of hurt. Never stopped us dreaming. Labour's coming home." But in June, Mr Blair was trying to dampen down expectations and not sound too triumphalist, after inflicting a fresh defeat on the Conservatives in local elections. But Mr Major's defeat was not quite bad enough to trigger a fresh crisis in his leadership with the Tory share of the vote rising two points to 28%, while Labour dipped three points to 43%. It was enough for the Tory leadership to claim that Labour under Tony Blair had "peaked" - Cabinet loyalists were claiming natural Tories were starting to return to the fold. The newspapers were full of headlines about Mr Major's "fighting talk" - telling his "warring party" they could still win. Tony Blair and Paddy Ashdown, whose Liberal Democrats had made impressive gains, accused Mr Major of complacency. But the prime minister, who had won in 1992 against the odds and seen off a leadership challenge from John Redwood, rejected talk of resignation. "I am here and I am going to stay here right through the general election. I think we can win that general election. I am going to bend all my efforts to winning," he told the BBC. As in 1991, Mr Major was pinning his hopes on economic recovery - and there were genuine grounds for optimism. Unemployment was falling, growth had picked up, inflation had been tamed. Things could only get better. The then Chancellor Kenneth Clarke was talking with confidence about the return of the "feelgood factor". He was right - but it would be Tony Blair that benefitted from it when voters went to the polls. The Tories - riven by bitter infighting over Europe and battered by a relentless stream of stories about "sleaze" - were increasingly seen as spent force. In what now looks, with the benefit of hindsight, a move of near desperation, Mr Major latched on to the "beef wars" as a possible source of salvation. His decision to go to war with Europe over a ban on British beef, in the wake of the BSE crisis, was seen as a high risk strategy. But for the briefest of moments in May 1996, it looked like he might be on to something. Tony Blair and Lib Dem leader Paddy Ashdown went to ground, for fear of being seen as unpatriotic. There was talk of a "beef election". "For the first time, I can see the outlines of a possible election victory," one eurosceptic Tory MP told the Guardian. Some newspapers were even talking about the beef war as Mr Major's "Falklands moment", although others attacked it as jingoistic. Mr Major also wrapped himself in the union flag over the issue of devolution, with Labour promising referendums for Scotland and Wales. The next election, Mr Major told the Scottish Conservative conference in May 1996, would decide the fate of "our Parliament, our Union, our country... It's not just a matter of tax and wallet politics, it is a matter of the nature, heart and fibre of the whole United Kingdom". Mr Blair had learned the lesson of the 1992 election and was determined not to give any ammunition to opponents on tax and spending a year in from the '97 poll. He was not taking anything for granted - to the frustration of his party's left wing. Like Mr Cameron now, Mr Blair faced accusations of high-handedness from some of his own backbenchers. He had also been attacked by opponents for not spelling out in detail what he would do with power. That was about to change with the publication of Labour's Road to the Manifesto policy document, which 350,000 party members were to be asked to vote on - despite the plan being opposed by the more traditional Labour powerbrokers on the National Executive Committee. "He is totally ruthless but you have to admire him," one left wing Labour MP told The Sunday Times. "After 17 years in the wilderness, Labour is desperate for power, so it will swallow most of Blair's medicine," observed the paper's political correspondent Andrew Grice. 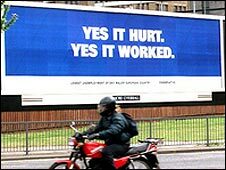 The Conservatives had yet to work out a convincing line of attack against Mr Blair - a series of advertising campaigns had failed to hit their intended target. They had tried to say Mr Blair may be different but his party had not changed - a campaign which evolved eleven months before the 1997 election into the "New Labour, New Danger" posters featuring a smiling Blair with devil-like eyes. But Labour, which had relentlessly attacked and harried the Major government, claimed that they were not going negative in their campaigning. Voters want a "positive message and a change of government", the then shadow chancellor Gordon Brown told Channel 4 News, sounding uncannily like his current challenger David Cameron whose party, like New Labour in 1996, is riding high in the polls. Mr Brown may prefer to take comfort from John Major - who after losing a crucial by-election to Labour in Monmouth in May 1991, on the back of disastrous local election results, had to endure taunts from Neil Kinnock that he was "running away from the ballot box" by not calling an immediate general election. "We are on an upswing and I think Labour has peaked," reasoned Mr Major to snorts of derision from Labour. Eleven months later he was proved right.